(Text automatically translated) large terrace of 30 sqm, located in the town center just a few meters from the slopes, with working fireplace and equipped tuttigli accessories. Because is very convenient to get to ski slopes: the cable car (Val Veny) is in ten minutes walk directly from the house and brings to the Courmayeur Resort where there are about 30 slopes also connected to Courmayeur. Otherwise there is the Mont Blanc slopes (for good skiers!) from la Palud, a village nearby Entreves (where the house is). it is at about 20 minutes walk or 3 minutes by bus. we were pleasantly surprised, the chalet is better than the pictures suggest. Bedrooms and bathrooms upstairs and a large open plan kitchen / diner / lounge downstairs which allowed all of of 7 person group to be togther in evening. The house feels like the owner stays there alot and has only slightly tidied up for the rented period. But we like that, it feels homely and there is lots of equipment, oil pepper and salt and stuff in the kitchen already. Water and heating hot. Comfy beds. Parking - you can't park by the house really because of the very small access lane. But we parked in the Val Veny lift car park without problems, its only a few mins away, and saves carrying all the ski stuff back to house. Val veny location is beautiful place, I never skied Courmeyeur before, quite small resort but we loved it, sunny crispy snow. One of the best skiing hols we have had actually , 5 stars. I never got to meet Angelica , the owner, but she was very good with communications, friendly and when the kitchen sink got blocked it was sorted out efficiently. Thank you. I hope to stay again, maybe in the summer for walking. Recommended.! It was great having you and Celia in our house! Liebevoll eingerichtet, es ist alles da, was man braucht. Der Ort ist sehr authentisch. 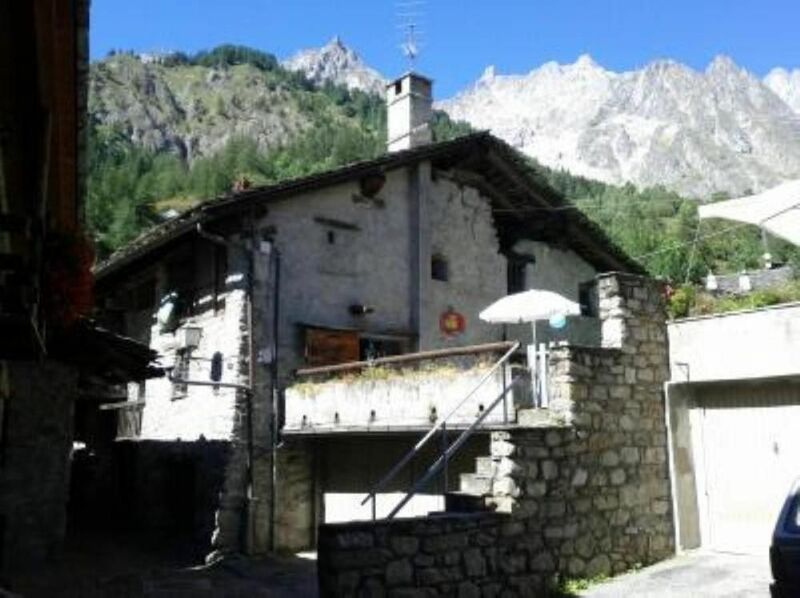 "Casa inserita in contesto di grandissimo pregio, villaggio tranquillo ma servito ai piedi del Monte Bianco, nelle immediate vicinanze di Courmayeur. Immobile assolutamente accogliente e funzionale con ottime dotazioni cucina e servizi in genere. Arredi curati e di gusto. Terrazzo godibile con vista mozzafiato sulle Grandes Jorasses, massiccio del Monte Bianco. Comodo sia per gli impianti invernali che per le vallate ove si pratica il trekking estivo. Rapporto coi proprietari cordiale e nella piena correttezza. Assolutamente consigliabile sia a famiglie (8 posti reali) che a gruppi di amici." Dans un cadre très agréable, cet appartement situé dans une maison de caractère est très confortable et particulièrement bien situé.